Changing the filter for your heating and cooling system is one of the most important maintenance procedures you can perform. It not only ensures that your HVAC systems are running as efficiently as possible and saving you money each month on your energy bills, but they also help to preserve the life of your HVAC system and keep your house clear of indoor air contaminants. You should get in the habit of replacing your filter regularly so that you can save yourself money and know that you’re living in a safe home. If you have any further questions about filter selection, replacement, or any other HVAC related needs, don’t hesitate to contact your local HVAC specialists at Comfort Solutions Heating and Air. We specialize in AC and furnace replacement, repair, and maintenance, as well as air quality testing, gas heater repair, and home performance evaluations. Call us today if you have any questions. An air filter is exactly what it sounds like: a device that filters air as it is pushed through your HVAC system. Many people don’t realize this, but their air is constantly being circulated through your HVAC system, so if the air isn’t being filtered correctly, you could be breathing in harmful allergens, dust, pet fur, and other unpleasant things. Your air filter is located between the return air ducting and your furnace or air handler before the air is heated or cooled. Although filters are there primarily to prevent dirt and debris from building up and affecting the performance of and reducing the life of your system, they also serve a second purpose to make your home safer to inhabit. Air filters are ranked by the MERV rating system which stands for Minimum Efficiency Reporting Value. Filters with a rating on the lower end of the scale remove fewer air contaminants while filters on the higher end remove more. But it’s not as simple as just picking the lowest rating filter to save money or the highest rating filter to better protect your home and system. Keep reading to learn more. What MERV rating do I need? The MERV rating you choose for your air filter will depend highly on the HVAC system you have installed, as well as the home you live in. Let’s take a look at each type of filter to see what they can do for your home. 1-4 MERV – Air filters rated 1-4 are the lowest end filters on the market. These filters will remove large contaminants that will damage your HVAC system, but they won’t do much to improve your home’s indoor air quality. 5-8 MERV – These air filters are typically 1-2 inch pleated. They will last a bit longer than filters with rating 1-4 and will remove smaller contaminants such as mold spores and hairspray fumes. 9-12 MERV – Since filters with this high of MERV rating block so many contaminants, they should be checked more frequently. However, they’re typically a great filter for both residential and commercial application. 13-16 MERV – 13-16 MERV filters are the highest rated filters on the market. These filters are often used in hospitals and other places that need to be very clean and free of airborne contaminants. Most HVAC specialists will not recommend these for use in residencies because the restricted airflow can be taxing on your HVAC system. However, if someone in your home has asthma or allergies, it may be recommended. 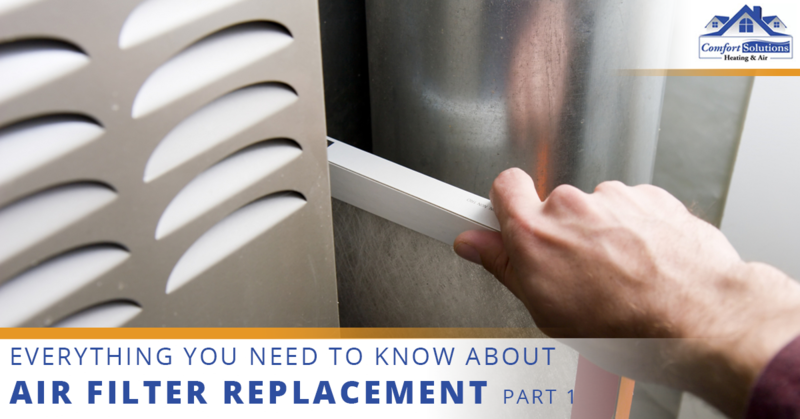 Ultimately, you’ll want to speak with your HVAC specialist to help you determine which air filter might be best for your home. If your current filter isn’t doing the job, they may recommend you switch to a different filter with a different MERV rating. 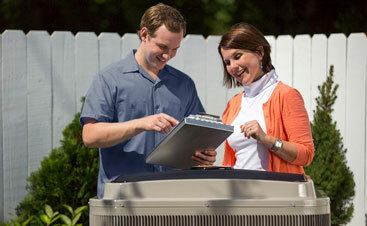 Are you looking for a certified HVAC contractor in Lawton, Oklahoma City, or the surrounding area? 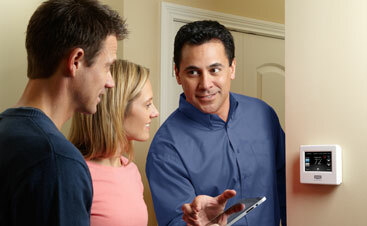 Comfort Solutions Heating and Air is here to help. Whether you’re having trouble determining what air filter you need or you just need annual maintenance or repairs, we’re confident we can provide you with exactly what you need. We offer a 100 percent money-back guarantee on everything we do, so you have nothing to lose! Contact us today if you’re ready to get started. Read part two of this blog to learn more about filter sizes, installing a new filter, and replacement frequency.